The TOPQSC Fitness Trampoline Trainer is both compact and portable. It is designed to fit small spaces in the gym or at home, and its convenient size lets you carry it from one spot to another without any hassle. Trampoline workouts are ideal for men and women alike. If you want to start getting fit or if you've been working out for some time now, if you don't want to go outside to exercise, just get yourself in TOPQSC mini-trampoline and try trampoline training! Trampolines work out a wide range of muscle groups, such as the cardiac and skeletal muscles. They help build muscle mass and strengthen the shoulder, hip, and leg muscles. If you are an athlete, using a trampoline trainer as an addition to your exercise routines will improve your performance in sports. One advantage of this trampoline trainer is that it boosts cardiovascular health. It increases the heartrate and minimizes the risk of cardiac disease. A variety of exercises and intensity levels can be added to increase your strength training sessions and get the maximum benefits from your exercise routine. This trampoline has a durable construction, super spring upgrade, resistance design, bid farewell to yellow buckle, play high pressure, can withstand up to 330 pounds. 1. COMPACT, FOLDABLE AND PORTABLE: The TOPQSC Fitness Trampoline Trainer is both compact and portable. It is designed to fit small spaces in the gym or at home, and its convenient size lets you carry it from one spot to another without any hassle. It is well-constructed and has six supporting legs and continuous rebound bands. 2. SAFE AND FUN: Trampoline workouts are ideal for men and women alike. If you want to start getting fit or if you've been working out for some time now, if you don't want to go outside to exercise, just get yourself in TOPQSC mini-trampoline and try trampoline training! 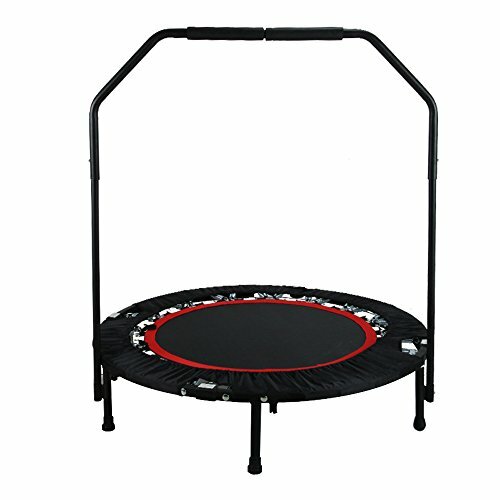 Enjoy a safe and energizing cardio session with this mini-trampoline without impacting your knees and joints. 3. INCREASES BALANCE AND COORDINATION: Trampolines work out a wide range of muscle groups, such as the cardiac and skeletal muscles. They help build muscle mass and strengthen the shoulder, hip, and leg muscles. If you are an athlete, using a trampoline trainer as an addition to your exercise routines will improve your performance in sports. 4. ENHANCES HEART RATE AND BURNS CALORIES: One advantage of this trampoline trainer is that it boosts cardiovascular health. It increases the heartrate and minimizes the risk of cardiac disease. Jumping up and down on this trampoline trainer will help you burn calories, lose weight, and tone both your upper and lower body. 5. UNIQUE AND DURABLE: A variety of exercises and intensity levels can be added to increase your strength training sessions and get the maximum benefits from your exercise routine. This trampoline has a durable construction, super spring upgrade, resistance design, bid farewell to yellow buckle, play high pressure, can withstand up to 330 pounds. Moreover, its unique design lets you fold it into a small, compact size for easy storage. If you have any questions about this product by TOPQSC, contact us by completing and submitting the form below. If you are looking for a specif part number, please include it with your message.